You may qualify for this card if you have achieved an NVQ or SQV level 3 or if you have completed an approved indentured apprenticeship (e.g. with NJCBI, BATJIC etc.) or an employer sponsored apprenticeship which included the achievement of a City and Guilds of London Institute Advanced Craft Certificate. If you do not have these qualifications, you may apply for a skilled card if you are experienced in your job (see Experienced Worker Card for more information). All applicants must pass the CITB Health, Safety & Environment Test. For Advanced Craft occupations you should take the operative or the Specialist test depending on your occupation. To book the test please click here. The gold card is available for supervisor and technician occupations. 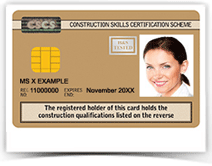 Achievement of an NVQ or SVQ level 3 in a relevant occupation is required to apply for this CSCS card. For those who do not have an NVQ or SVQ level 3, application is by the experienced manager card. CSCS has recently introduced the Profiled Route which is for highly competent supervisors.